Skilled planners and engineers take every design consideration into account to deliver an exceptional, crystal clear digital or physical blueprint. Designing a new parking lot or shipping bay in a site development project requires more careful planning than meets the eye. Every component of the pavement structures we develop are built in accordance with the American Association of State Highway and Transportation Officials guidelines when applicable to ensure a standard of durability and functionality. Our parking lots feature modern design, eye-catching landscaping, and treat runoff effectively. Ohio Paving & Construction will explore developing or updating an existing retention/retention pond, rain garden, or infiltration trench on-site to prevent water buildup from causing major damage to the subgrade or pavement structure in the future. 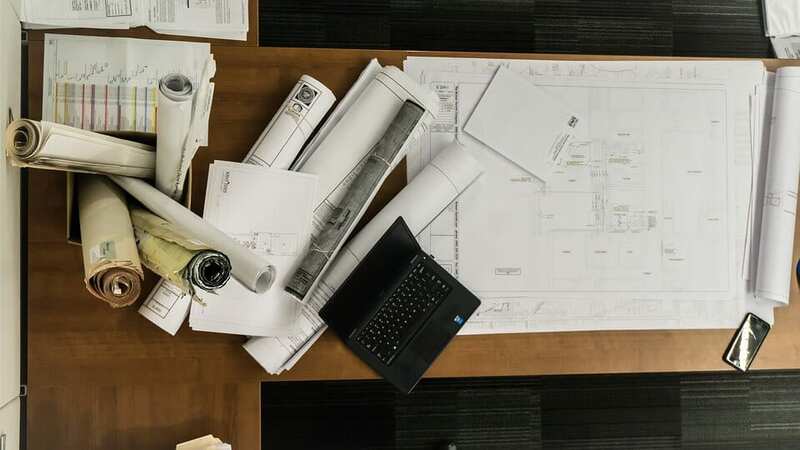 Our engineers at Ohio Paving & Construction will use a comprehensive list of design considerations as well as the preliminary site survey developed by the construction site surveyor. The kinds of parking lots we are capable of designing vary widely, from gravel to the new, green paving technology known as porous asphalt. Each of these generally fall into a category of rigid pavement, flexible pavement, or permeable pavement. Concrete is the most common paving material used for residential driveways, and is considered a rigid pavement. A rigid pavement is one topped off with PCC (Portland Cement Concrete) and is much more stiff than a flexible pavement- as you may have guessed. While the stiffness of concrete has its advantages in resisting damage, it is also more expensive to repair. 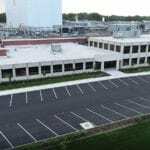 Our concrete parking lots are developed in accordance with ACI 330 Design Guidelines by the American Concrete Institute. Asphalt, making up ~95% of U.S. roads and highways, is a bituminous material that offers the kind of flexibility that concrete does not- hence the umbrella term it falls under, “flexible pavement.” The layers that make up an asphalt pavement work together to distribute the weight loads of passing traffic to minimize the damage of localized stress. While asphalt is cheaper to install, maintenance needs arrive more often. Asphalt is also a “greener” material due to the ability to recycle an asphalt surface layer to be re-applied after processing, or used as gravel. 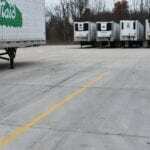 Gravel parking lots are uncommon, but they are a cost-effective, environmentally-friendly way to pave a parking lot. Developing a suitable sub-grade before installation is important to keep the gravel from being buried or moved out of the parking lot area, as well as proper drainage to keep “puddling” from occurring or flooding in any undesirable area outside of the parking lot. Porous asphalt is an innovative way to address storm water issues. Six layers of asphalt, stone, and non-woven geotextile work together to give you a pavement that water soaks directly through into the earth below. Porous asphalt is one of the various kinds of permeable pavements. Having a parking lot pavement designed is the first step to a new construction project, a parking lot or commuter lot expansion, a site development project, or an excavation contract. Ohio Paving & Construction serves real estate property development companies, property management companies, urban planning committees, site developers, churches, manufacturing plants, factories, large corporations, and councils. Most often, we coordinate directly with architects, landscapers, operations directors, managers, site surveyors, construction contractors, owners, and organization trustees. The weight class of incoming buses, trucks and cars, and volume of recurring traffic. The various measurements allocated to the parking area. The Americans with Disabilities Act (ADA) regulations and designing around compliance standards. The number of necessary parking spaces to meet maximum occupancy. Parking spaces we create exist with dimensions suggested by Qcode.us, which are 9’x18′. Planning pavement markings to ensure a smooth flow of traffic. Landscaping elements arrangements set to discourage “shortcutting” through planted brush. Minimizing obfuscation of illumination throughout the parking area. Properly sloping pavements to eliminate water buildup and guide moisture to proper drainage areas. Soil types and profile, sometimes verified through lab testing. Ultimately, the objective of parking lot design is to create a durable pavement structure with an obvious, smooth flow of traffic that is safe for pedestrians and vehicle operators alike. Whether the client has contracted for a design-build or just the architecture design, Ohio Paving & Construction takes the client needs assessment and builds the 3D blueprint to meet each specification. It is important that the designer has every variable available to him or her before beginning the design, including parking lot performance requirements, the comprehensive site survey and the design proposal. There is generally a high degree of back-and-forth deliberation between the designers and the client throughout the design process. Once a client is satisfied with the outcome, the parking lot design project is delivered in both a digital and physical format. After a design has been delivered, the customer has the option of choosing to take his design to another construction contracting company, or continue to work with Ohio Paving & Construction, also known as choosing a design-build. A design-build is the age-old practice of the same entity seeing through the construction project from imagination to conclusion. There are great advantages to having a design implemented by the same company that created it. Such advantages include convenience in consultation over blueprint details, speedy clarifications about unforeseen conflicts with the blueprint and the construction site, and a reduced risk of design implementation errors. Cost reductions are also available to clients who build their project with the designer’s company. When the same company designs & builds a project, the option to begin construction before the design has been delivered becomes available. This can drastically reduce the timeframe on a project and save more money for your company. When you decide to construct your parking lot and/or driveway project with Ohio Paving & Construction, the first step is surveying the land to double check that the underlying sub-grade will be sufficient to support the pavement structure and properly distribute the intended weight that oncoming and resting traffic will induce. The ability of the underlying soil to absorb water will also be done through various percolation tests. This should have been verified during the original site survey. Once the land has again been confirmed to be suitable, land clearing begins down to the sub-grade for the parking lot pavement. Next, the necessary drainage ditches will be formed by excavation. Depending on the existing system of water redirection and soil’s rate of water absorption, new catch basins will either flow into existing enclosures or into new ones as directed by the site plan. The next steps depend on whether or not you have chosen a permeable pavement, flexible pavement or rigid pavement for your project. If the pavement is a permeable variant, the sub-base of crushed stone or gravel will be formed, followed by an installation of the permeable pavers and often a vibratory compaction of all the layers together. The installation of a flexible pavement, such as traditional hot-mix asphalt, will require the crew to lay an asphalt layer with a slightly larger aggregate following by a compaction, and then a tack coat to better adhere the finally laid surface layer of asphalt. Each layer will vary in its thickness based on a number of factors in the design plan: mainly, the general amount of weight the surface will be exposed to on a regular basis. A rigid pavement such as concrete will require the team to create “forms” within which the concrete will be poured. 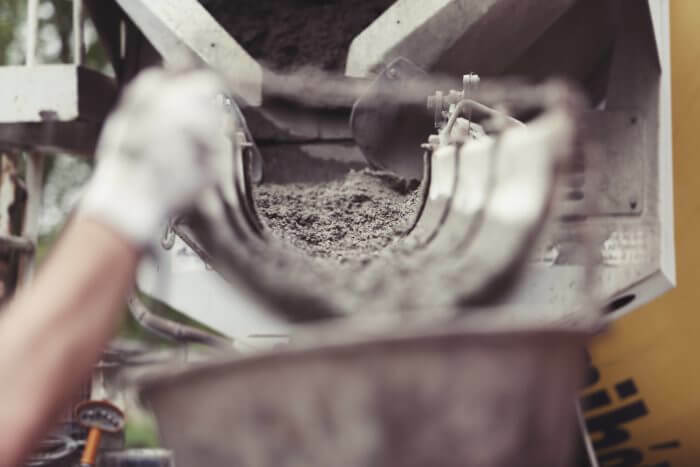 Concrete will be installed in “joints,” or sections which are attached by much thinner sections of concrete to guide the inevitable cracking of the pavement and minimize the aesthetic damage that will occur. A crew will then guide the concrete into shape and allow it to react and harden into its final product. After time for the right amount of curing has been granted, the process is finished with the contracted line striping, sealcoating, and/or bollard installation services. To get started on your parking lot design, contact our office by calling 440-975-8929, or email us at info@ohiopaving.com You can also use the contact form below.